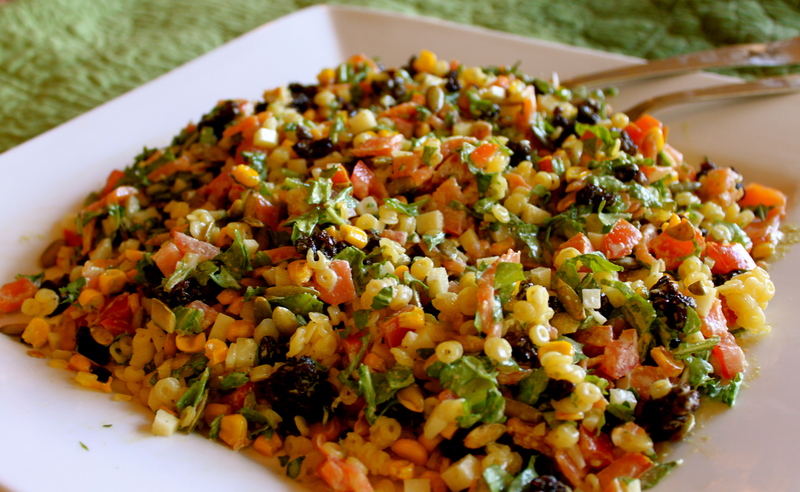 The Best Gluten Free Chopped Salad Ever….Seriously!! It is an easy salad to make – not very labor intensive or complicated at all. In fact, the most time consuming part is chopping up a few ingredients for the salad and then whirring the dressing away in the blender for a minute. The fun part is in the presentation. It is a salad that will surely “wow” your guests when you bring it to the table. The amazing color combinations of the wonderful fresh ingredients lined up so dramatically on the plate is definitely a conversation piece. But the best part is when you pour that amazing dressing over it all and create a cornucopia of flavors for the palette! This is truly one of my favorite salads to serve. It can be tailored to meet most food allergies, by subbing a few ingredients here and there, or leaving some out all together. I have tried it all which ways because I have this on a regular rotation of dishes that I make when guests come over… and it seems like I run with a circle of friends that covers the whole gamut of food allergies! Any which way you make it, it never disappoints. I have made a couple permanent alterations to the original recipe that the owner of the restaurant has made quite available over the years, just to ensure gluten-free status. First, the original recipe calls for Israeli CousCous. But since this is not gluten free, I have used both Brown Rice CousCous (such as Lundberg’s brand) or I have used Shär Gluten Free Anellini noodles that are even smaller than orzo and in the shape of little rings (do not use these if you are allergic to corn – they have corn flour in them). Second, I always double,triple, or even quadruple the recipe because I am usually cooking for a crowd, and even if there are left-overs (although not likely) this is a rare salad that I think is even better the next day (most get squishy and icky – not this one). 8 oz Asiago cheese, cut very fine (omit if you have Dairy allergy – or try one of the Vegan Cheese alternatives, reading ingredients if also allergic to Soy). If using Vegan cheese, I would cut amount in half since it will have a very different flavor and texture than Asiago ). 1. Prepare brown rice couscous or Shär noodles according to package directions (except use organic chicken broth instead of water and salt to taste when done). Let cool completely in refrigerator. 2. Place frozen corn in a single layer on a baking sheet and roast at 300 degrees for 30-40 minutes, to bring out the sweetness. Let cool completely in the refrigerator. 3. While couscous or noodles and the corn are being prepared, prepare dressing by blending the pesto sauce, mayo, and shallots in food processor blender. Slowly stream in buttermilk, then add lemon juice, salt, and pepper. This makes more dressing than needed for the salad, but it is wonderful saved for another use. I could personally eat it with a spoon. 4. 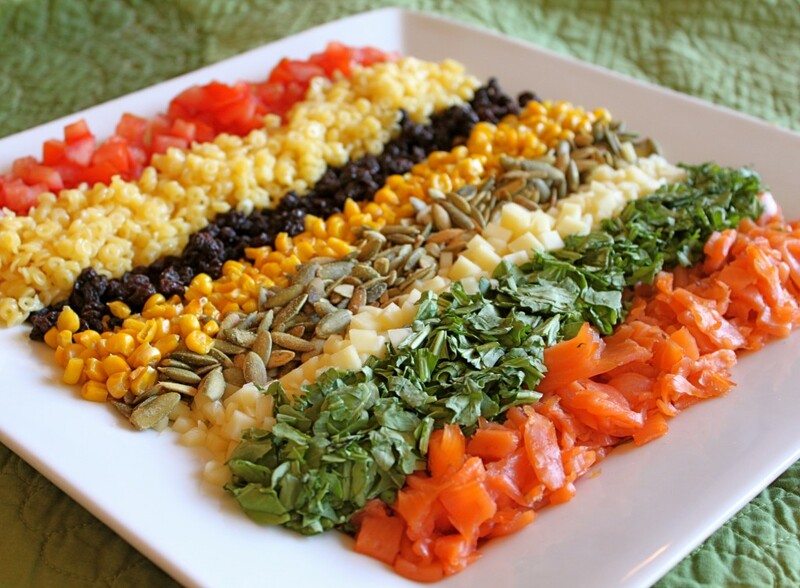 For a dramatic presentation, line each ingredient in a row on a nice platter and place on the table. Then pour desired amount of dressing on the salad and season with salt and pepper to taste. Otherwise, if this is just for you, place all of the ingredients in a large shallow bowl, toss with dressing and salt and pepper, and ENJOY!!!! And in honor of the fact that my iPhone App was featured in Apple’s New & Noteworthy section of the App store, I have decided to host a recipe contest that will be posted on Monday. The winner of the contest will receive an 8G 3rd Generation iPod Touch and a free download of my App. The Touch has all of the same features of an iPhone except for the ability to make calls: Pinch to zoom, Scroll through your favorite recipes, songs, music with just a flick, Download over 200,000 Apps, Watch movies and tv, And built in wi-fi to browse the web! So get those gluten free and allergy free recipes together! Anyone can win! this sounds like an exceptional salad!! thanks so much for sharing this wonderful salad recipe! Hey jessica! Yes, this is one that will not disappoint! Hope you like it! Such a stunning salad! I can hardly wait to try it!